For other uses, see The Drag (disambiguation). A portion of The Drag, as seen at night. 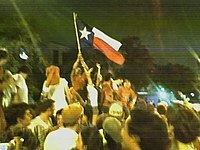 A spontaneous celebration on the drag after a Longhorns victory over Ohio State University. The Drag began as a strip of shops which provided vital resources to UT students. Bookstores, restaurants, and clothing stores fulfilled student needs. The proximity to campus, particularly the Main Building and the Union Building, added to the popularity of the street. Past and present buildings on the Drag include the Harry Ransom Humanities Research Center, Raul's, Captain Quackenbush's Intergalactic Espresso and Dessert Company, Record Exchange (later renamed CD Exchange at the NW corner of 21st Street), Hastings Music and Video (directly across from the West Mall and Student Union), Bevo's Bookstore, The Gap (at the SW corner of 24th Street), Al's Formalwear (at 29th Street), Tower Records, Nothing Strikes Back (combination pool/beer hall, black light ice cream parlour), The Bazaar, Texadelphia, Dobie Mall, Goodall Wooten private dormitory, and the University Baptist Church. Also, the Church of Scientology of Texas building is on The Drag. The Drag is considered an important part of Austin's civic life, but for many years many Austinites avoided it because of congestion. The area had fallen into disrepair, and some felt the area had become undesirable because of the presence of panhandlers known as "Dragworms", or more recently as "Dragrats." A project under the proposed Corridor Mobility Program (created under the 2016 Austin Mobility Bond approved by voters) would convert Guadalupe along the Drag from four travel lanes with discontinuous bike lanes, to three travel lanes (one being a dedicated turning lane), two dedicated transit lanes, and two continuous bike lanes. This project is projected to reduce CapMetro travel time through the corridor by up to three minutes. The project would also improve the surrounding streets in the West Campus neighborhood. ^ About6street.com, The Drag Archived August 22, 2007, at the Wayback Machine. Accessed 2008-01-02. ^ "Scientology Austin". Church of Scientology Texas. Retrieved 2014-03-25. ^ "The Drag on Guadalupe Street, Austin (Drag Worm; Drag Rat)". Retrieved 19 August 2011. ^ "The Drag". Austin Now. KLRU. Archived from the original on 2007-11-02. Retrieved 2008-01-02. ^ "GUADALUPE STREET CORRIDOR AND WEST CAMPUS DEVELOPMENT REPORT" (PDF). austintexas.gov. November 2017. Retrieved 12 February 2018. ^ Karacostas, Chase (5 December 2017). "City releases Guadalupe Street improvement recommendations". The Daily Texan. Retrieved 12 February 2018. ^ "MOBILITY, SAFETY, AND CONNECTIVITY IMPROVEMENTS" (PDF). Retrieved 12 February 2018. Don, Massa (Jul–Aug 1987). "Drag Lines". The Alcalde. 75 (6): 4–7. ISSN 1535-993X. Guadalupe Street, Guide to Texas Outside. Photos from the history of Guadalupe Street. This article related to Austin, Texas is a stub. You can help Wikipedia by expanding it. This page was last edited on 10 January 2019, at 06:06 (UTC).